This image was taken from a Travelodge adjacent to the fire. Firefighters are still hosing down an office block destroyed by fire - more than 24 hours after the first flames. Fire took hold of the four-storey complex in Tabernacle Street, on the border between Shoreditch and the City of London, at 0400 GMT on Thursday. More than 100 firefighters tackled the fire, which left parts of London's financial centre covered in smoke. It was under control by 1120 GMT on Thursday, but firefighters were still damping down hot patches on Friday. London Fire Commissioner Ron Dobson said: "This was a complicated fire spreading rapidly through different premises and onto a bitumen-covered roof, creating huge plumes of smoke across the city and presenting very difficult firefighting conditions. "This incident yet again highlights the need for our fire safety work to prevent the fire risk and disruption these incidents have on our capital." The fire severely damaged the third floor and roof, with the ground, first and second floor also badly affected. The Sosho Restaurant and upmarket East Room private members club were both destroyed. East Room owner Jonathan Downey said the venue, into which he ploughed £3m, had been left structurally unsafe and may collapse. 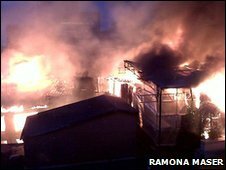 A London Fire Brigade spokesman said: "During the night we had four fire engines there and we still have two now. "There are still a number of hot spots so we haven't handed the building over. We could be there quite a while longer. "With this level of damage a roof collapse would not be surprising."